EagleSpeak: Sunday Old Ship Photo: "Showboat"
Worth noting the maximum range of the 16" guns was about 23 miles. Current Burke-class guided missile destroyers carry Tomahawk cruise missiles with a potential range in excess of 700 miles, depending on configuration. After commissioning, the North Carolina had an unusually extensive shakedown, lasting several months. 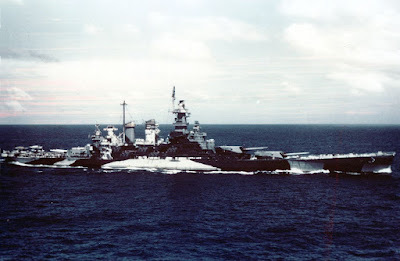 During this long "shakedown" period, the North Carolina returned often to her building yard for adjustments and modifications. During this time, New Yorkers, and in particular radio commentator Walter Winchell often witnessed the great new "battlewagon" entering and departing the harbor, and began to call her "The Showboat", after the colorful river steamer in a popular Broadway musical. The name has stuck ever since. If she was hit with a Tomahawk, they would pipe Sweepers.